I've always been a fan of unplugging. I avoided an iPhone for as long as possible, sticking with a phone that made calls and sent texts way longer than most. Now that I literally have the world at my fingertips, I have to be more conscious about making the decision to unplug. When I studied abroad, we had no cell phones, and wifi was scarce. We might check in on the free computer in the hostel we stayed at, if there was even one available. 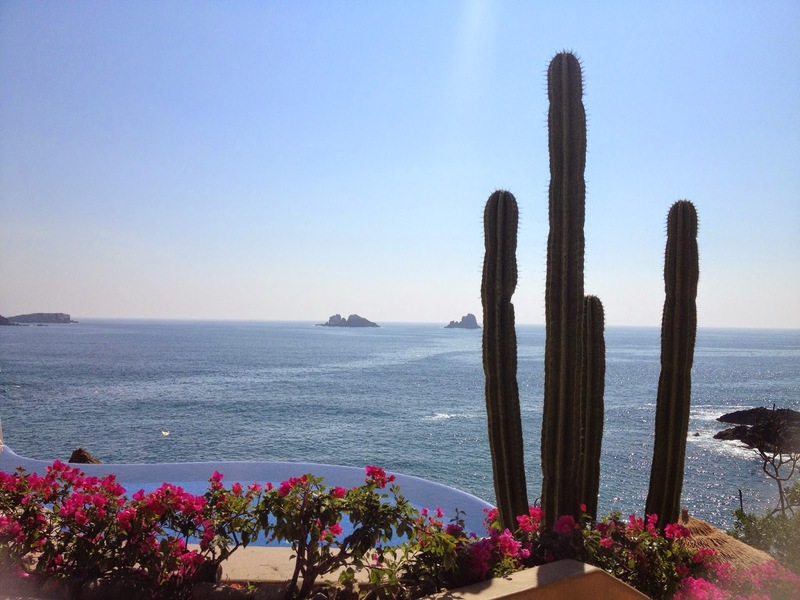 I just remember feeling so free on those trips, and completely aware of everything around me - because I wasn't distracted by anything else. It might not always be realistic to be disconnected for a prolonged period of time. When this is the case, I'll set boundaries and check in once a day or every two days on a longer trip (like our recent two week jaunt around New Zealand). I'm still using my phone to take pictures and as a wireless remote for my camera, so it's important to me that it's not buzzing and distracting me. Enjoy every minute! Here are my tips for staying connected with limited time spent online/on your phone. I don't know how you people do it. The only notifications I get are texts and phone calls. Email and apps are set to be checked manually, rather than pushed through every time someone likes my Instagram photo or J.Crew sends another sale email. If you need/prefer the Push settings during everyday life or for work, I would suggest you take it down to the bare minimum while you're traveling or on vacation. If you want to take it all the way down (or if you're traveling internationally), put it to Airplane Mode! I can't stand the little red number in the corner of my mailbox.... so as soon as the emails load, I have to read and take care of them right away or I'm stressed out (Matt lives with 20k unread emails on the regular and I have no idea how he lives with it). I was also sick of waking up to 30 new emails, and only 1-2 of them being anything worth opening. 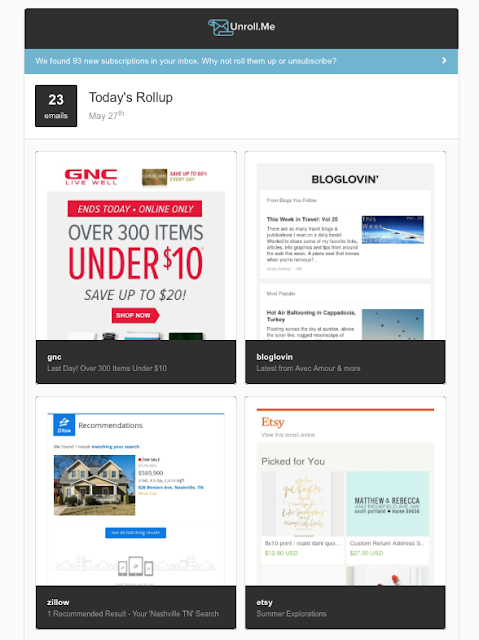 I signed up for Unroll Me and it's really changed my inbox stress! Unroll Me scans your inbox and gives you the option to Unsubscribe, Add to Roll Up, or Keep in Inbox. I unsubscribed to everything I didn't care about (promotion I signed up for two years ago), Added to Roll Up anything like Victoria's Secret, Madewell, or PetCo who sends sale emails I'm interested in SOMETIMES, and Keep in Inbox was anything I would need to see as it comes in, like emails from Airbnb bookings, or The Skimm. Anything you add to your roll up will be sent to you in ONE big email, ONE time a day! 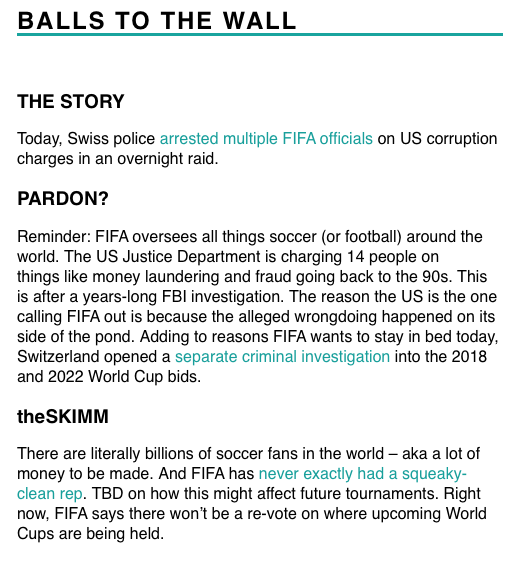 The Skimm keeps me informed in about 5 minutes with news from all over the world. Which means I won't get back from a cruise and have no idea that the government was on strike (true story! ), or that a plane tragically crashed into the Alps while I was flying to New Zealand (also true). Sign up here even if you aren't going anywhere! 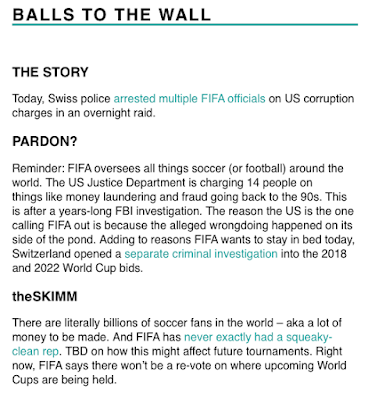 Just a little excerpt from today's Skimm about the FIFA controversy! This feature is a miracle worker. It stops your phone from vibrating or ringing AT ALL, while still leaving it available to receive calls or texts. It's essentially "silent". This really should be mandatory in weddings, funerals, meetings and coffee shops (in my opinion!). Just to keep yourself from being constantly distracted, turn on the do not disturb. Swipe up on your home screen, and click the moon symbol :) This can be particularly helpful if you're in a group message. You could even switch that message chain only to Do Not Disturb! Open the message, click Details, and switch on Do Not Disturb. I also love using it at night when I'm in a different time zone - keeps you from accidental wake ups (your alarm still works when DND is activated). PS - this is in no way a sponsored post. I just love the Skimm & UnRoll me!